If you want to be taken seriously, you hire McKinsey & Company. Founded in 1926, McKinsey can lay claim to the following partial list of accomplishments: its consultants have ushered in waves of structural, financial, and technological change to the nation’s best organizations; they remapped the power structure within the White House; they even revo­lutionized business schools. 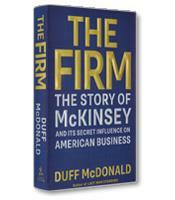 In The New York Times bestseller The Firm, star financial journalist Duff McDonald shows just how, in becoming an indispensable part of decision making at the highest levels, McKinsey has done nothing less than set the course of American capitalism. 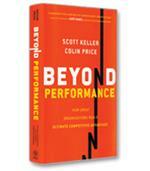 In the world of management consulting, McKinsey sits at the top of the mountain. Yes, there are others, notably Boston Consultant Group (BCG) as it is inevitably called in the trade, but McKinsey remains the marquee firm of the industry. Not surprisingly, McKinsey consultants don't come cheap. But are they worth it? And in an ever-changing world of new challenges and pressures and paradigms - a world in which entire industries can disappear, iconic firms can be pushed aside by impertinent upstarts, and management and leadership norms and guiding theories can travel from pedestal to trashcan in just a few years or quicker - why does an intellectual capital-based firm that came to dominance in the 1920s and 1930s still retain its dominant position? These are some of the questions that financial journalist Duff McDonald attempts to answer in The Firm, his exhaustive study of McKinsey and Company. The story that emerges from these pages is neither a story of a wise Merlin nor a devious and destructive Rasputin, but a mix of both. On the Rasputin side of the ledger is the barely remembered fact that McKinsey was the consultant of record for Enron and General Motors, the first a criminal enterprise, the second a dominant behemoth that lost its long-held world leader position in its industry. McKinsey also accompanied the once well-regarded Swissair airline into bankruptcy and, according to court records, tutored Allstate in avoiding payment on claims. And then there's the head-shaking story of the 1950s government contract in which the government official on one side of the table and the McKinsey consultant on the other side of the table were one and the same man. Such stories, however, would have horrified the eponymous founder of the firm. In the mid-1920s (the founding date of the firm is 1924 or 1925, according to different sources), James McKinsey was an academic with a long list of degrees, including law, philosophy, and accounting degrees, who had written several very dry tomes on the nitty gritty of accounting. McKinsey's brilliant insight, however, was to see accounting not just as bookkeeping, but also as a strategic tool. Although blindingly obvious today, at the time, McDonald notes, "the idea of planning, directing, controlling and improvement decision making by means of regular and rigorous report of company results was novel." McKinsey turned these ideas into what he called the General Survey Outline, a 30-page system, McDonald writes, "for understanding a company in its entirety, from finances to organization to competitive positioning." The GSO would be the core intellectual foundation of the firm, helping McKinsey consultants to completely analyze the workings of the client company and thus be able to isolate and develop solutions to their specific problems. While the Rasputins grabbed the headlines, the Merlins went steadily about their work. McKinsey launched his firm on its journey, but it is managing partner Marvin Bower who built the firm up through much of the 20th century and is responsible for its leadership position in the field. It is Bower who developed the firm's culture, including the concept of value billing: simply charging its clients what it thinks its services are worth without bothering with the mundane issue of hours. And it is Bower who expanded into government and across the globe. There have been challenges and setbacks - from scandals to serious competitive attacks from the likes of Boston Consulting Group - but in 2011, it is still McKinsey that presidential candidate Mitt Romney chose to invoke when asked how he would reduce the size of government. "I would probably bring in McKinsey," said the former head of, ironically, an offshoot of McKinsey competitor Bain and Company. The Firm is a good overview of the history of the company, which benefitted not only from the ambition of its leaders and hard work of its consultants but also the luck of its timing. A little more detail on some of the successful advice given to clients would have been welcomed, but that is probably a function of the company's secrecy. The culture of the company, McDonald explains, is to let the client get all the credit - which, in the long run, also lets "the firm" escape the blame.